I wore this lace embroidered coat for a day in the city few weeks ago, and wanted to share the beauty of it with you guys. It’s safe to say that there is one more thing in addition to traveling that makes me extremely happy. Yes, you have guessed it right, it’s the details. Details in architecture, art, clothing… Details are what makes the world go around. Details are what brings flavor to the world. It brings life to anything, just look around you, and see how you feel when you look at something with details, as opposed to something that is without. I actually pondered about it a lot on this day as we explored the city and the art museum. I was watching people stare at an elaborate engraved vase from the Renaissance literally for hours. In fact all the art work with details would be most viewed and the most crowds would be gathered around it. As opposed to the modern art, which is known to be less detailed, still beautiful in its own way but it can not be compared to something like a rococo paintings. When you think about it, it is the same with clothing and how much more exciting something looks with elaborate details compared to something that doesn’t have details. 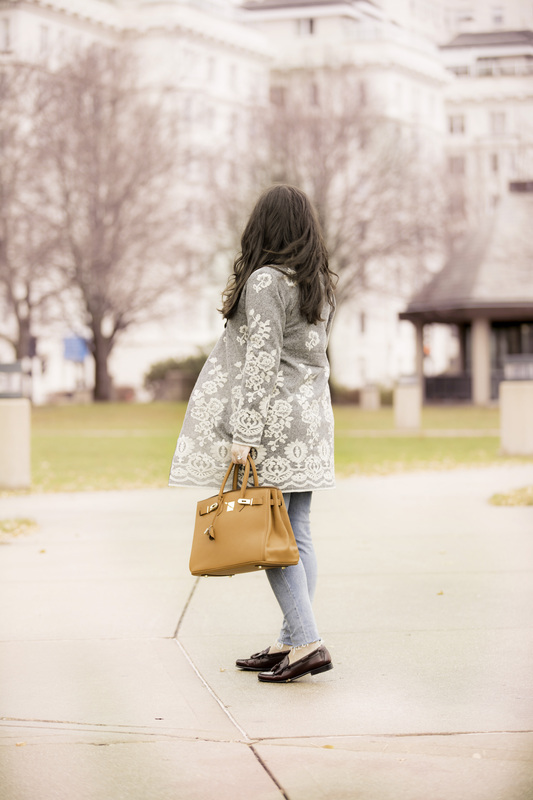 All this love for elaborate details is slowly spilling into all of my areas of life clothing, decor, furniture… Maybe that is why I gravitated towards this beautiful lace embroidered coat. Also, what I love about is it’s versatility. It can be worn with jeans and loafers for a casual weekend. Or it can be dressed up with a little black dress for a fancy dinner and all the holiday parties coming up. Just like the Rococo paintings and the Renaissance vase with all the details and people just not wanting to take their eyes off of it, wearing this coat will definitely be a show stopper walking in to any room. I highly suggest you go take a peek at this beautiful coat from Soft Surroundings. This is such a chic outfit, Bailey! I LOVE your lace embroidered coat!! So pretty! Love the shoes too!! Lovely look! What a great outfit to wear those shoes with!